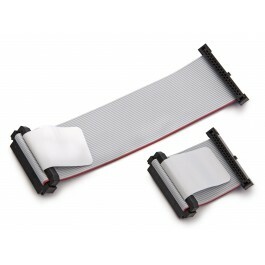 The image shows the 40mm and 100mm versions of the 34 pin ribbon cable. We recommend the shortest cable possible for all applications. This is a replacement cable for the PromiraTM Serial Platform. One 34-pin end has a locking friction ramp to ensure good connectivity with the Promira platform while the other 34-pin end is designed for easier connection and removal to your project board. This cable is compatible with the EEPROM Socket Board - 10/34, the Flash SOIC-16 Socket Board - 10/34, and the Flash SOIC-8 Socket Board - 10/34 programming accessory boards. Many of our other accessory boards utilize our standard 10-pin header. The I2C/SPI Activity Board, the CAN/I2C Activity Board Pro, and the High-Speed SPI Flash Demo Board require a 10-pin connector. Please select the 34-Pin: 10-Pin Header Cable to enable connectivty for these acessory boards with the Promira platform. Don't have space for a 5x2, 0.100 inches or a 17x2, 0.079 inch (2.00 mm) header on your test board? Want to make use of a header that doesn't have the same pin-out as the Aardvark™ I2C/SPI Host Adapter ribbon cable or the Beagle™ I2C/SPI Protocol Analyzer ribbon cable? Don't want to create an adapter board to interface with your target? The 10-Pin Split Cable, 10-Pin Grabber Clip Split Cable, 34-Pin Split Cable or 34 Pin Grabber Cable may be the ideal solutions for you. For more advanced or power intensive applications, the 34-pin cables are recommended because they provide additional connectivity to your project, enabling features not available with the 10-pin cables. Please note, specific pins and functionality are determined by the applications licensed on your Promira Serial Platform. The 34-Pin Header Cable has a 34-pin box header that attaches to the Promira Serial Platform. The connector is a standard 2x17, 0.079 inches (2.00 mm) pitch IDC type keyed box connector. The cable is only 6 inches (15.2 cm) long to minimize signal degradation.